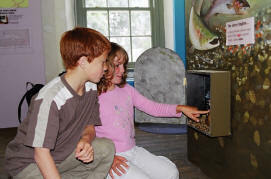 Learn all about the life cycle of the King of the fishes from the Salmon Wall display. 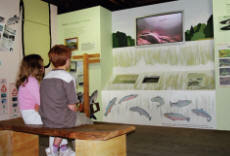 Then see what dangers lie in the river and how many survive after the female salmon has laid 5,000 eggs. 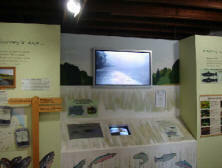 Then watch the Salmon live on the interactive video screen and choose from 4 different cameras around the edge of the Ettrick river. Then take a look at see how many salmon have passed through the fish counter which is in the fish ladder in the middle of the cauld. The counter is reset at the start of every month. 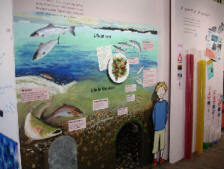 The final wall explains how you can make it easier for a salmon to survive as it makes its way to spawn. See salmon leaping up the cauld on the last leg of their epic journey in season (either May & June or Sept to Nov when river is high) - all just a few minutes walk from the centre.